How to transform an abandoned plot into a shared neighbourhood garden? To inspire the creation of temporary (nomadic) local gardens on empty plots throughout Paris. How to transform an abandoned plot of municipal land into a shared neighbourhood garden? The Jardin Nomade (JN) is in a quiet residential part of Paris, situated between two busy streets to the East of the Bastille. Despite the lively shopping, café and bar activities which attract young people and tourists from all over Paris, a local spirit persists in these neighbourhoods, and is fiercely supported by local associations such as the Association du Quartier Saint Bernard (AQSB). On the initiative of local residents, supported by the AQSB, the JN was developed as a community garden, built on a 270m2 site, abandoned for almost a decade. Daily care and cultivation of the vegetable garden is undertaken by local residents & families and local schools provide environmental education activities for the children. The JN transformed an insalubrious abandoned plot into an open, healthy, shared community garden, offering a free and open space where locals of all age groups can meet and share this project. Claudine Raillard, professional gardener, provides the general management and supervision of the garden, draws up contracts, distributes individual garden plots, gives gardening advice & programmes activities, undertakes environmental research (such as water collection) & also organised the brick architecture (hut) project. The AQSB also organize monthly meetings, within and beyond the neighbourhood (by holding social events, such as soup parties), making sure that something is always happening in and around the garden, developing local initiative. JN has inspired the design of a system (“Main Verte”) by Paris City Hall Parks and Gardens Department. Many years to persuade City Hall. JN is open since 2003. After several years of persistent action and a change of municipal leadership, in 2003 an insalubrious eyesore was transformed into a dynamic, locally run garden, meeting and events space. From an empty plot, finally the first flowers and vegetables were harvested in 2004. The garden is booming! The JN is now authorised to remain on site until 2010. JN has inspired the design of the Main Verte system which is an environmental charter created by the Ville de Paris (Parks & Gardens Department), which underpins the protocol for use of the garden, and sets out rules for environmental behaviour. The charter has served to inspire other similar projects in Paris and its periphery. The garden is matured and the success of the neighbourhood dynamic widely recognised. Originally designed to “move on” once the city-owned plot is reclaimed (a multimedia Centre is programmed to replace the garden in 2010), locals hope that the City will make the garden permanent. This seems more and more probable. City Hall loans the site, provides infrastructure (water & electricity), servicing (waste management) & equipment (fencing, soil, growing boxes). JN provides management, supervision & gardening advice & distributes the 54 garden plots @21€ each, 50% for JN (insurance, maintenance, phone, small equipment, meetings, parties), 50% to City Hall (for childrens projects). JN inspires inter-generational interaction, involvement with schools (“extending” activities outdoors to a safe, local city venue), associations, & creates a healthier environment. Claudine Raillard (AQSB) is devoted to community action and increasing environmental awareness through city gardening. Principally used by local populations plus some passers-by, teenagers are taking an interest in the garden since the mural was painted by young graffiti artists, animating the back wall and making the garden visible from far away. Even elderly and unemployed are finding roles/exchanging expertise. 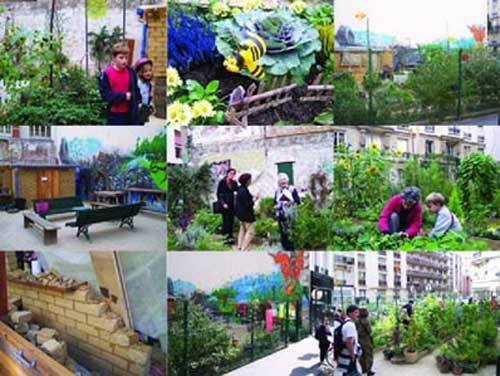 The “Main Verte” charter supports such initiatives as part of Paris City policy for sustainable development – encouraging local consultation/participation, “greening” the city, etc. Within the system, all sites must respect the environment, develop biodiversity & encourage actions to develop environmental and civic responsibility, especially in the young. The garden is maintained at a very low cost due to the enthusiasm of the individual/ institutional plot hirers. The system is possibly over reliant on goodwill, unpaid workers.